There are many things to do in Plattsburgh, New York during the winter. The Adirondack winters are beautiful with snow-covered mountains and frozen lakes. Nearby attractions like Lake Placid and Whiteface Mountain are popular sites this time of year that provide many opportunities for winter sports, events, and activities. You don’t have to stay cooped up inside at home all winter long. We’ve got a list of fun things to do that will keep your social life going during the cold months, like community events, snow sports, and holiday festivities. The Saranac Lake Winter Carnival is one of the longest-running events of its kind, first debuting in 1897, hosted by the Pontiac Club. It has grown into a 10-day festival that includes sports, performances, two parades, and three sets of spectacular fireworks. It kicks off with the coronation of the king and queen, a royal couple who has been chosen for their commitment and service to the Saranac Lake community. The festival continues with an extensive schedule of events. The centerpiece of the carnival is the Ice Palace, made from massive blocks of ice! 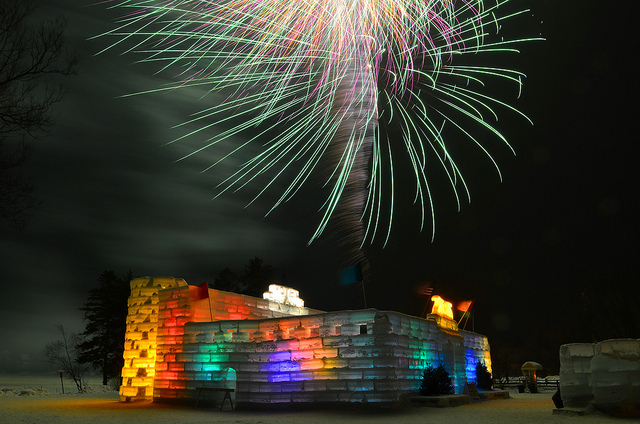 The Ice Palace at Saranac Lake Winter Carnival of 2015, lit up under the firework show. Photo by Robmadeo via Flickr. Ice skating is a traditional winter activity. At the Olympic Oval, you can skate around the same ice as former Olympian speed-skaters from the 1932 and 1980 games. Bring your own blades or rent a pair on site, and spend an afternoon twirling around the rink, breathing in the fresh mountain air. In the center of the rink, there’s a fire pit to warm up by and hot chocolate available. This is a great activity to do with a group of friends or family, or as a cute winter date for couples. Find more information on ice skating and other snow sports at Whiteface Mountain, Lake Placid. Mirror Lake is a sight to behold when it freezes over. In the heart of Lake Placid, it’s the focus of a lot of fun winter activities, including dog-sledding. On super chilly days, you’ll see the dogs and their mushers along Main Street. Hop aboard and you’ll get a dog’s-eye view of Mirror Lake as you’re pulled across the ice. No matter which outfitter you choose, tickets typically run about $10. When: Winter season through April, weather dependant; Wednesday–Sunday, 9 a.m.–4 p.m.
Have you ever wondered what it would be like to ride in a sleigh like Santa’s? 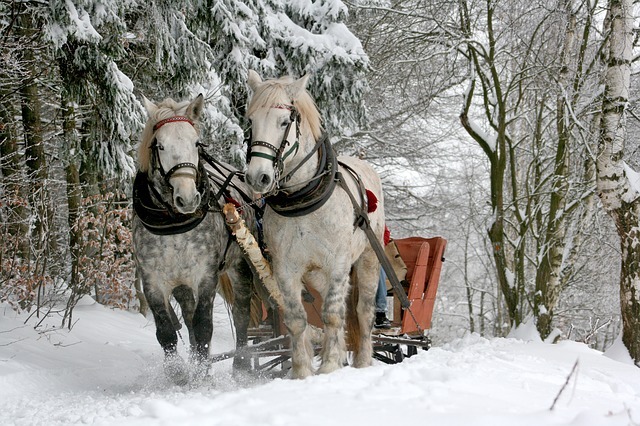 Adirondack Sleigh Rides at Country Dreams Farm give you a chance to find out! This magical experience includes a ride in a horse-drawn sleigh with thick blankets to keep you warm. Your driver will take you through the mountains under unforgettable starry-night skies. After the ride, head over to the cabin to cozy up by the wood stove with a hot cocoa. For more ideas on what to do in Plattsburgh, New York this winter, visit the local events calendar. We hope you’ve found some good ideas here that will warm up your winter!